Michael Jordan is the Man in Mexico! You can tell just how popular a professional athlete is by how they are perceived in countries outside the U.S. If they have a world-wide appeal, you know they are special. And to this day, there is not one player that is any bigger than Michael Jordan. Both ESPN and Upper Deck honored MJ as the “Athlete of the Century” and he remains one of the most recognizable athletes in the world. 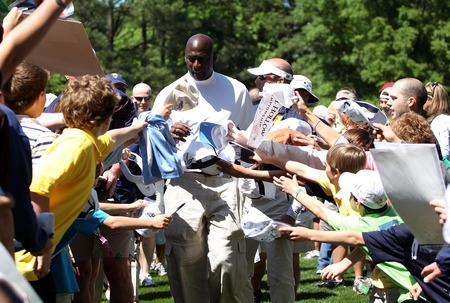 There’s no disputing his popularity, heck we even met one fan who had Jordan’s autograph tattooed to his leg. 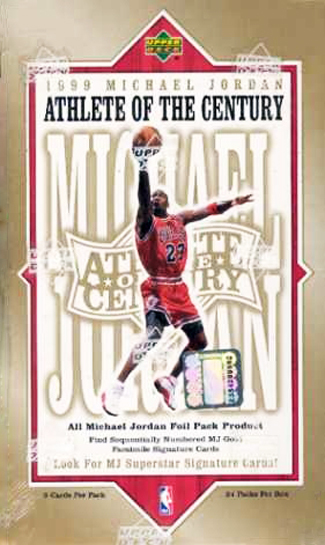 Upper Deck produced a set of trading cards for Michael Jordan honoring him as the athlete of the century. “I’m a big basketball fan so I wanted to have a place to show my love for the game. I built a sports bar in the basement of my house that is 1500 square feet where I have some of my favorite basketball items housed. I’m proud to say that I don’t think anyone else in Mexico has a room quite like this. 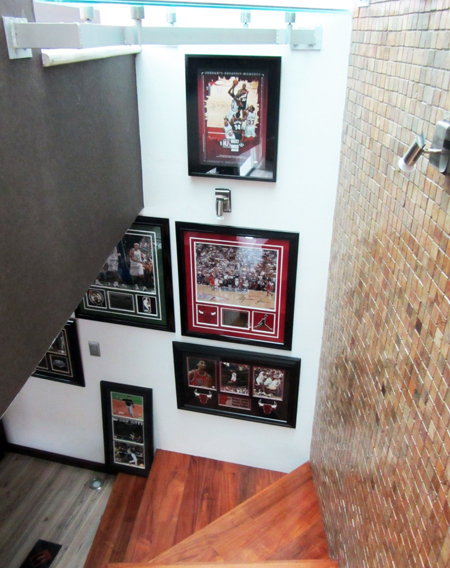 As you walk down to the basement of Victor's house, you begin to see the Michael Jordan memorabilia. 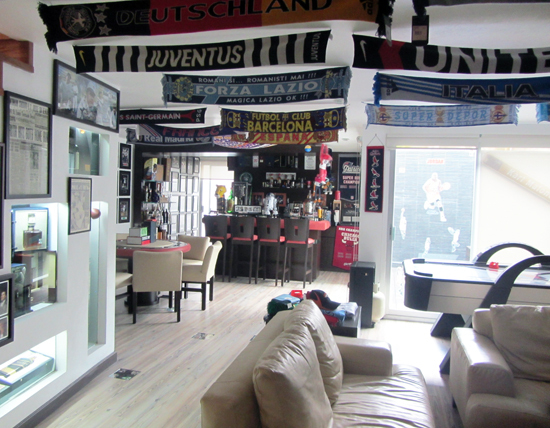 Victor has a beautiful sports bar in his basement with plenty of memorabilia from soccer and other sports, but most is from Michael Jordan. “I have no idols in my life, except for one; Michael Jordan. I believe he is the greatest athlete of all-time from any sport. I built this room in his honor. I’ve collected everything that has to do with Mr. Jordan over the last 15 years and in the bar I have a wall dedicated to his awesome achievements. “It was always a dream for me to watch him play and I was lucky enough to attend two of his games. I saw him once in Washington D.C. and also went to his last game in Philadelphia in April of 2003. 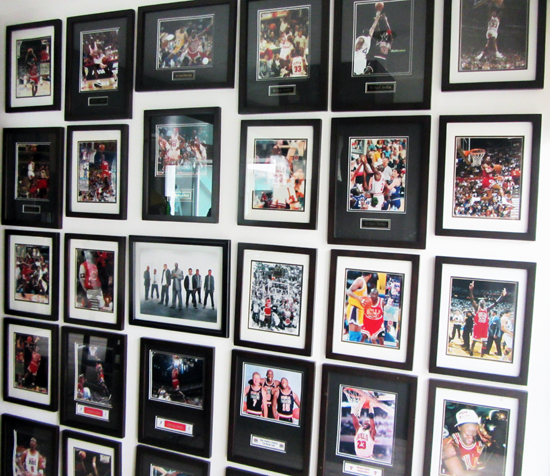 Victor has an entire wall dedicated to Michael Jordan. “I actually had the chance to meet him and talk to him for a few minutes. It was a dream come true and I showed him some pictures of my bar. He was very kind and signed a ball and jersey for me. I know not everyone in the world has the opportunity to meet the greatest athlete to ever walk the earth, so I feel lucky every time I think about that day. It was an unforgettable experience. It is difficult to get close to Michael Jordan, but Victor had the opportunity once and made the most of it. Encased in the floor of his sports bar is that memorable ad from Jordan's last game in Philadelphia. Amazing fan there. Only die hard Jordan fans need apply.